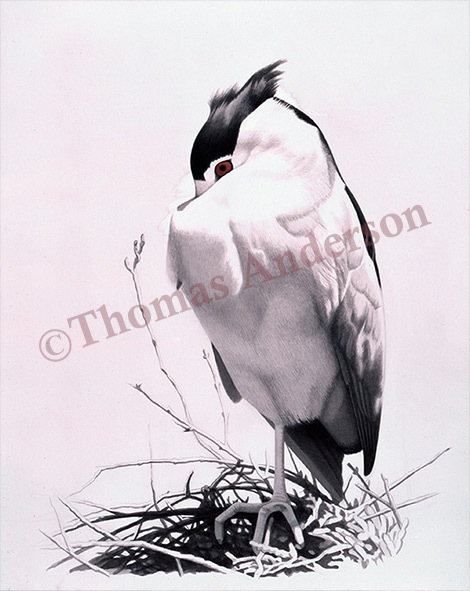 Ink, Graphite & Watercolor, 20" x 15"
Another loafing Black-crowned Night Heron attempting a mid-day snooze. By 2000, I was starting to veer away from everything I had gotten used to with watercolor. I wanted this composition to be different — more than a study, but different from my finished pieces so far. I used mostly ink, a little bit of pencil, and red watercolor for the eye. I challenged myself to restraint: I eliminated everything from the background to accentuate the focus on his seemingly bashful expression: buried bill, one-foot-tucked-in position, and the red of his eye. Shy, however, is not an adjective appropriate to night herons; that would be projecting human qualities where they don’t belong. But they are most active at night.